The £1.35bn Queensferry Crossing over the Forth has officially opened to traffic today. Despite severe weather hampering the timetable for delivery, the project was hailed by the Scottish Government for coming in £245m under its spending budget. 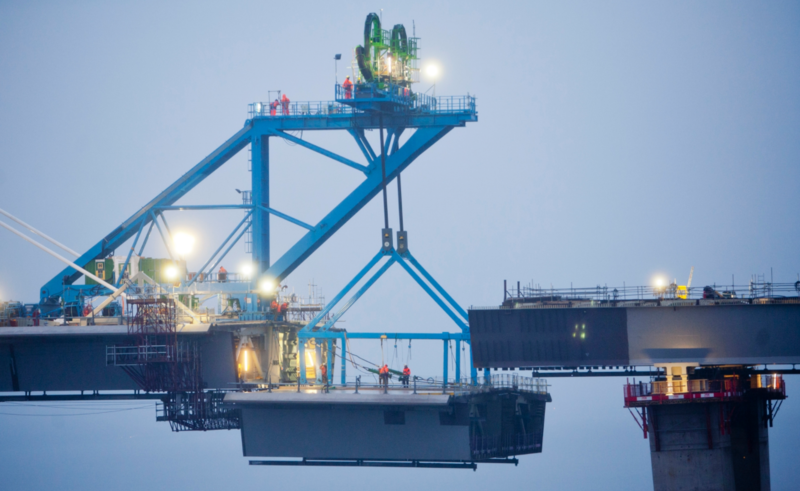 Joint venture builder Dragados, Hochtief, American Bridge International and Galliford Try have had to battle against harsh weather condition seeing the completion date pushed back twice and the bridge opening eight months later than originally targeted six years ago. At the time the consortium secured the design and build job with a £790m bid, significantly lower that the initial estimated cost of somewhere between £0.9bn and £1.2bn. Because this bridge contract ran until June 2017, the project is technically just 10 weeks late. The time overrun has had no impact on the overall budget as the joint venture contractors are responsible for all costs associated with the over-run. The bridge has been a catalyst for employment and business opportunities since work began. Over 15,000 people have been inducted to work on the construction site since 2011, clocking up over 18 million hours of work in the process. The structure spans 1.7 miles (2.7km) making it the longest three-tower, cable-stayed bridge in the world. Project Director David Climie said: ” It’s been a real roller coaster of emotions but the over-riding emotion at the moment is one of pride. “Until you’ve actually been out on the bridge during severe winds it’s hard to appreciate the task at hand of delivering such a complex project. Economy Secretary Keith Brown, said: “To think that the crossing has been completed six years from the date construction started and ten years since Parliament approved legislation is a remarkable achievement for a project of this scale and complexity. “The challenges of this location have been well-documented and the real heroes are those who have braved the elements in sometimes horrendous conditions to finish the job. “This project has released £245m of savings back into the Scottish Budget since construction began. Quite often we see and hear of projects running significantly over budget, so I believe we should be proud of this achievement and take confidence going forward. 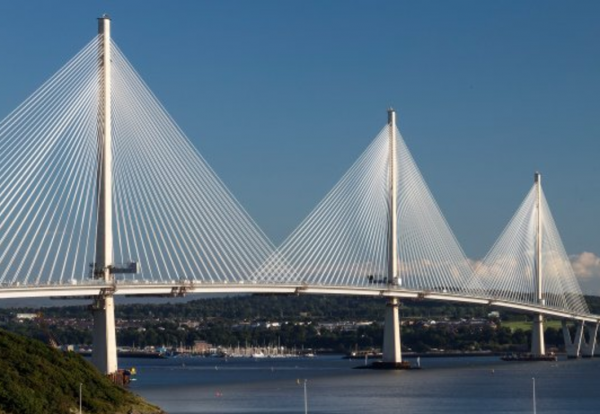 The bridge features pioneering new windshielding, which should almost entirely eliminate the need for closures during the frequent periods of high winds in the Forth estuary.